ROHM has recently announced the availability of a new lineup of high power wide terminal thick-film chip resistors (10-910mΩ) ideal for current detection in a variety of applications, including inverters, AC, and energy-efficient appliances. A thorough review of the resistive material allowed ROHM to improve rated power to 2W in the compact 2550 size (2.5×5.0mm, t=0.55mm) – 4x higher than conventional short-terminal types – contributing to improved energy savings and greater miniaturization in high power applications. The new family is available in 48 values. In addition, optimization of the element structure makes it possible to achieve best-in-class TCR (temperature coefficient of resistance) characteristics among wide terminal thick-film chip resistors. The result is minimal resistance fluctuation due to temperature changes, enabling high accuracy current detection. Recent years have seen a marked increase in the number of circuits used to monitor current in a variety of applications, spurring demand for current detection resistors for controlling and managing current. This significant growth in embedded components requires compact, high power resistors. ROHM continues to lead the industry in product development, beginning with the world’s first chip resistors. For applications demanding reliability, ROHM offers resistors that provide features such as high power, anti-surge, and sulfuration resistance that have been well-received in the industry. Adding this new lineup of low-ohmic resistors enables support for a wider variety of applications. Going forward, ROHM will continue to leverage the latest, proprietary technologies and expertise to expand its industry-leading portfolio with products optimized to customer needs. 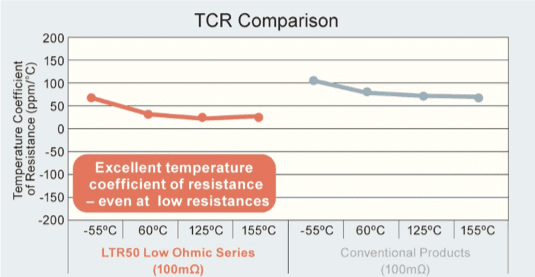 Generally, TCR increases as the resistance decreases, but optimizing the resistive element structure allowed ROHM to achieve class-leading TCR characteristics. For example, in the case of 100mΩ, the LTR50 series delivers a TCR of ±100ppm/°C, ensuring stable resistance. A thorough review of the resistive material made it possible to improve rated power to 2W in the compact 2550 size (2.5×5.0mm, t=0.55mm) — 4x higher ROHM’s conventional MCR50 low-ohmic series (0.5W). This allows customers to reduce set size by using smaller resistors. The internal resistance of many materials changes in response to variations in temperature. This rate of change is called the temperature coefficient of resistance, or TCR. The lower this value is, the less the resistance change due to a change in ambient temperature, making it possible to suppress variations during device operation.